those of you interested in our favorite subject, POTTERY. and the History of Pottery view these pages. Ken George is our potter. 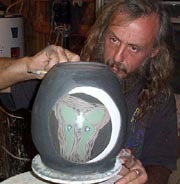 He is a master potter, ( such as a master carpenter, or painter). 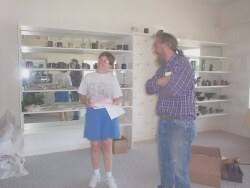 Ken is knowledgeable in all aspects involving the Art of Pottery. 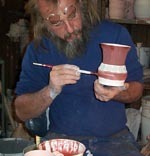 Ken has been a potter for over 20 years. He wheel throws all of his pottery. 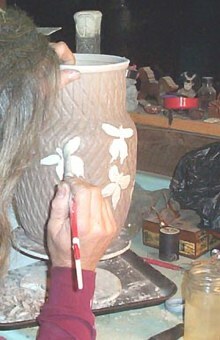 Many times Ken uses clay from our farm to make his pieces with. He works the clay by sieving and cleaning it. 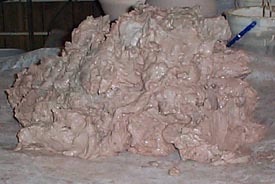 Follow this link to learn how you can mine your own clay. 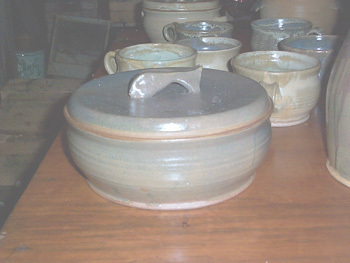 Sometimes he mixes different clays together to make certain clay bodies. 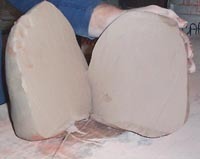 The next step is preparing your clay for throwing or building. 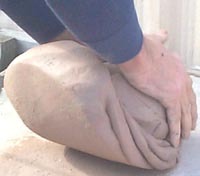 A process called wedging, helps to rid the clay of air bubbles. Air bubbles can cause your piece to blow up inside the kiln during firing. 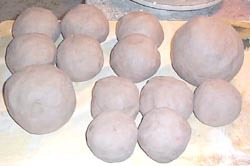 Rolled clay balls about to become art pieces. large and small. This piece was a Christmas "Bird of Peace"
COLORED CLAY SLIPS and GLAZES. Many times he hand ALTERS his pieces. and then the clay body was carved or INCISED for decoration. or highly polished with color clay slips. 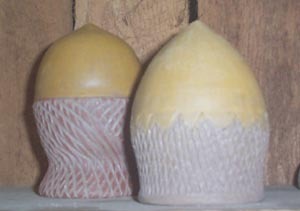 colored clay slips (only one way potter's paint their pieces). 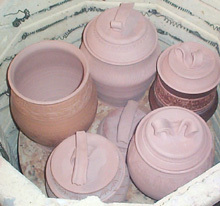 his pottery before cooking it or firing it in the big wood kiln. 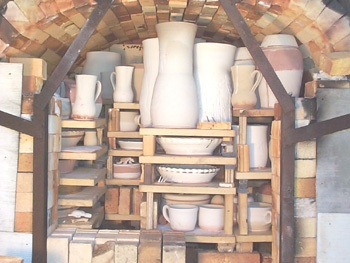 He bisques his pieces in this kiln to 1900 degrees F.
They are ready to be loaded into his wood firing kiln. The front door is bricked up after Ken has finished loading the kiln. 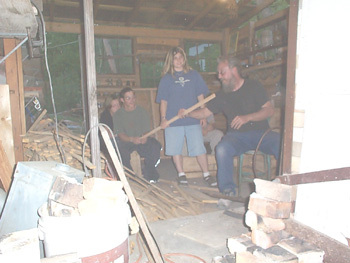 The wood is then started on fire. (sort of like a really big barbecue pit). This is the side of the kiln. The stoking holes are also located here. See the fire on the side near Ken? He is putting more wood in. 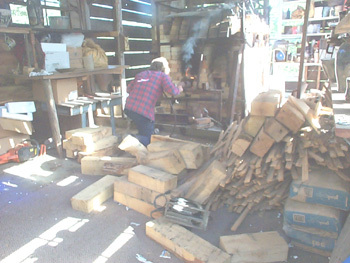 Ken is making charcoal on the bottom of the kiln floor. reaches temperatures of 2400 degrees F. and more. It can take many hours to reach the desired temperatures. 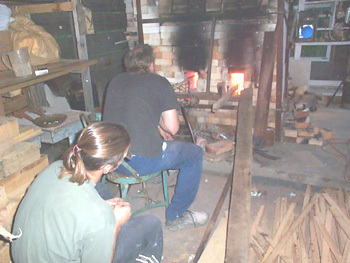 Ken will stay and work by the kiln until it has finished firing. This process can take from 15 to 24 hours usually. 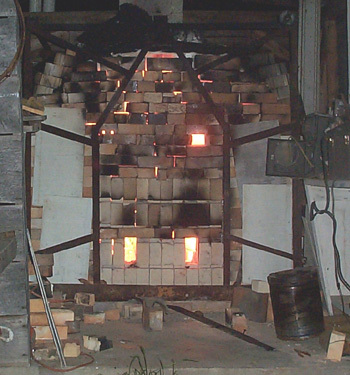 See the orange glow of the fire going on inside the kiln. Smoke is bellowing from the sides. This picture was taken at 5:30 am. of approximately 2800 degrees F.
After about 24 hours the kiln is cool enough, yet still Very Hot. Ken begins to un brick one brick from the door at a time. 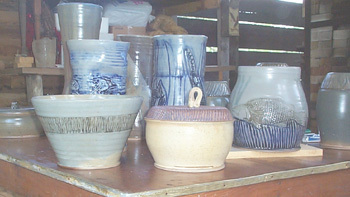 off the pieces inside the kiln. pieces would probably crack. Sudden temperature changes. Very hot to cooler. 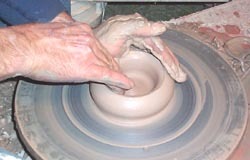 Like placing a hot glass on a cold surface will crack the pottery. 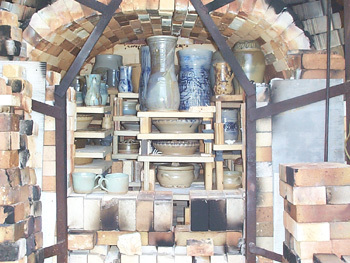 The kiln is opened completely and cooled art pieces are then removed. Big bowls, Vases with lots of fish and a giant ACORN. What is that for? Believe it or not, it is a casserole for baking. This is a casserole to cook in. It has a fish for a handle. Notice the hand carved fish and the hand carvings around these pieces. 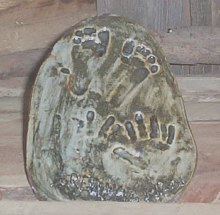 had her hands and feet imprinted in clay forever. Ken talking to the gallery owner, Mary. and the process which really has never stopped, begins again. won first place awards at their school. If you have Encarta, plug in pottery. Did you know the oldest dated artifact is a piece of pottery. Many pieces of pottery were found in the pyramids at Giza. 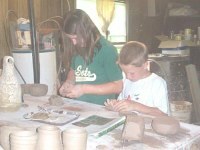 Have fun with the Art of Pottery. Please wear clothes that you don't mind getting dirty. 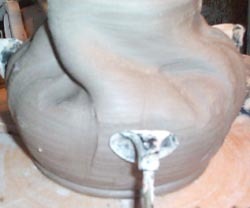 The clay will wash right out with warm water and soap. 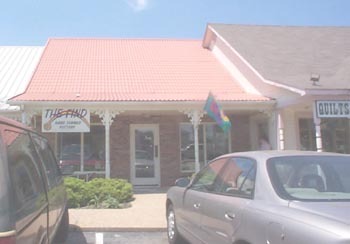 You can E Mail us with your questions anytime. Participate in our on line pinch pot project.